In this guide we take you through the steps to get our sample project, Hello Sdl Android, running and connected to Sdl Core as well as showing up on the generic HMI. 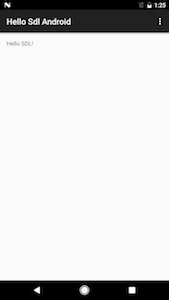 First, make sure you download or clone the latest release from GitHub. It is a package within the SDL Android library. Open the project in Android Studio. We will exclusively use Android Studio as it is the current supported platform for Android development. If you are not using a Ford TDK for development, we will assume that you have SDL Core (We recommend Ubuntu 16.04) and an HMI set up prior to this point. Most people getting started with this tutorial will not have a Ford TDK, so sample outputs will be using Sdl Core and our Generic HMI. If you don't want to set up a virtual machine for testing, we offer Manticore, which is a free service that allows you to test your apps via TCP/IP in the cloud. 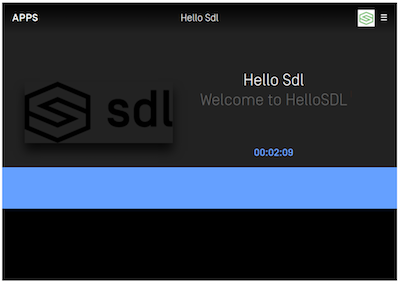 Hello Sdl Android has been built with different build flavors. To access the Build Variant menu to choose your flavor, click on the menu Build then Select Build Variant. A small window will appear on the bottom left of your IDE window that allows you to choose a flavor. There are many flavors to choose from and for now we will only be concerned with the debug versions. 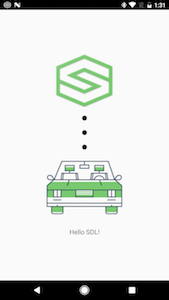 If you aren't using a TDK or head unit, you can connect to SDL core via a virtual machine or to your localhost. To do this we will use the flavor tcpDebug. For TCP to work, you will have to know the IP address of your machine that is running Sdl Core. If you don't know what it is, running ifconfig in a linux terminal will usually let you see it for the interface you are connected with to your network. We have to modify the IP address in Hello Sdl Android to let it know where your instance of Sdl Core is running. In the top of this file, locate the variable declaration for DEV_MACHINE_IP_ADDRESS. Change it to your Sdl Core's IP. Leave the TCP_PORT set to 12345. Right out of the box, all you need to do to run bluetooth is to select the multi_sec_offDebug (Multiplexing) build flavor. To connect to an SDL Core instance or TDK via USB transport, select the multi_sec_offDebug (Multiplexing) build flavor. There is more information for USB transport under Getting Started - Using AOA Protocol. For TCP, you may use the built-in Android emulator or an Android phone on the same network as Sdl Core. For Bluetooth, you will need an Android phone that is paired to a TDK or head unit via Bluetooth. Run the project in Android Studio, targeting the device you want Hello Sdl Android installed on. 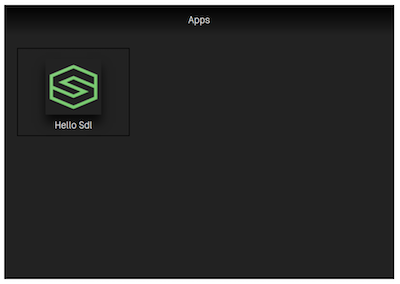 Click on the Hello Sdl icon in the HMI. This is the main screen of the Hello Sdl App. If you get to this point, the project is working. RPCs (Remote Procedure Calls) that can be made with the library. Sometimes things don't always go as planned, and so this section exists. If your app compiles and does NOT show up on the HMI, there are a few things to check out. Make sure that you have changed the IP in SdlService.java to match the machine running Sdl Core. Being on the same network is also important. If you are sure that the IP is correct and it is still not showing up, make sure the Build Flavor that is running is tcpDebug. If the two above dont work, make sure there is no firewall blocking the incoming port 12345 on the machine or VM running SDL Core. In the same breath, make sure your firewall allows that outgoing port. There are different network configurations needed for different virtualization software (virtualbox, vmware, etc). Make sure yours is set up correctly. Or use Manticore. Make sure the build flavor multi_sec_offDebug is selected.